….And iMPdraw v2.0 is coming soon… Of course, the picture (PINUPOLD) comes from Kris/iMPact ! Here are some screenshots and stay tuned ! … Get ready for the fight ! Awesome! Can't wait till the release! Great work!!! 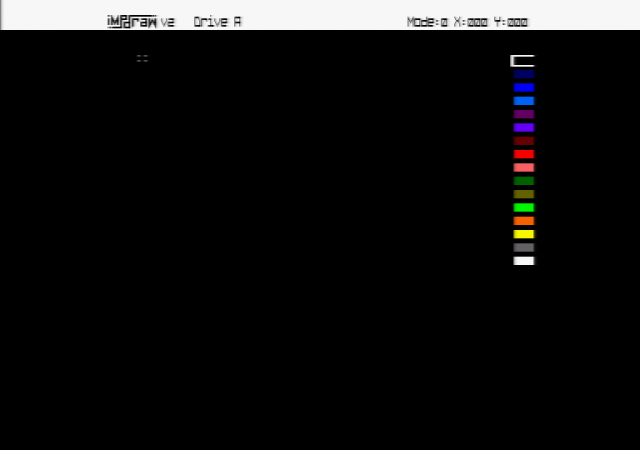 iMPdraw v2.0 can easily switch between Cpc Old and Cpc Plus mode now ! 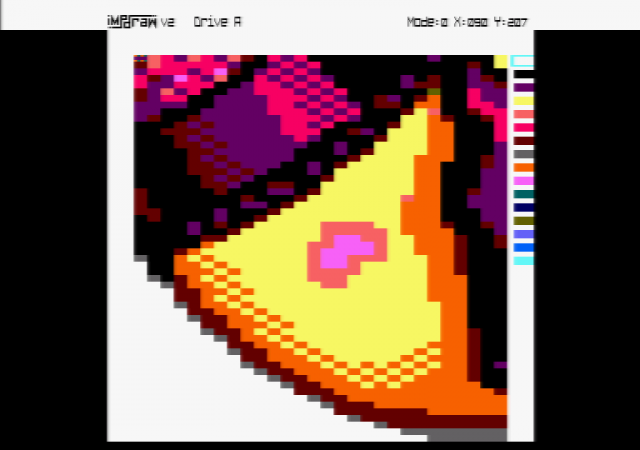 So, you could easily do pictures for Old Generation and make them with plus palette too. Nothing is impossible ! Just use your imagination and put some pixels now ! This screen was made by Kris/iMPact too ! Enjoy ! Kris is a very good grafix artist, nice! Is the tool also able to save (definable) parts of the screen? -win : well Known ocp windows (ocp compatible) which allows you to save every pictures pieces you want ! Is there a video to check out? Not yet ! But it will probably come !! I need serious beta-testers ! - Only xmem+xmass owners ! - Prompt feedback required ! Don't ask anything if you wouldn't do it, thanks. Thanks to Hal6128 for his personnal message! You win the right to become our new beta tester! If you will look for a pixel / image art / editing tool you will find in ImpDraw a perfect companion. It's fast, it's damn fast, especially together with ImpDos ...which is also fast by the way (...tried it first time). 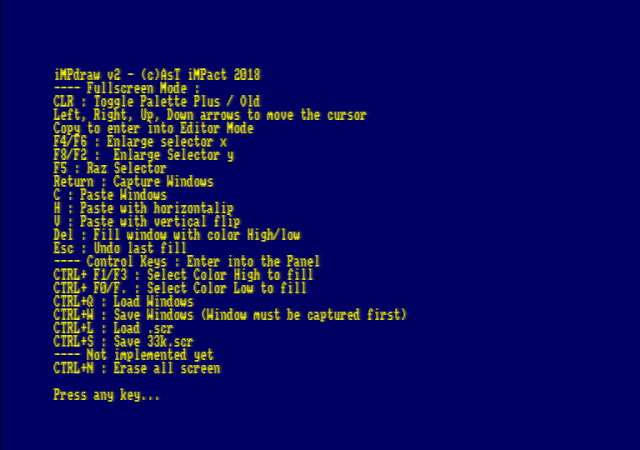 Loading a 32k image ... feels like a second on REAL hardware!. Switching between full/overscan screen (with some window manipulation tools e.g. mirroring, copying, pattern fill) and editor mode (pixel setting mode in a magnified environment / split screen) is fast. It also uses CPC PLUS capabilities. Of course, you need get to know the use of the keyboard keys for a fast handling. In case you don't know it anymore there's a separate help screen always available. What is also nice, you can leave the program into Basic environment, do something else, and switch back to the application with a full restored image. Those speed capabilities and handiness makes me focusing in doing what I want... pixel on a screen. It's not finished yet (first impression), but it looks very promising! Thanks for your deep testing HAL 6128! There is also many and many things to discover ! I am still working on iMPdraw v2, so stay tuned !!! Beb was a great source of inspiration. Hope you will appreciate ! Hi !! .. any release date ? It’s still in wip ! Very well. Take your time to make it really good! I'm looking forward to test it. Page created in 0.205 seconds with 103 queries.